We have been providing a service and supplying parts for all types & makes of fishing reels for over 2 years. All reels are serviced by the manufactuer or in house. Please make sure if your sending reels to package them well. 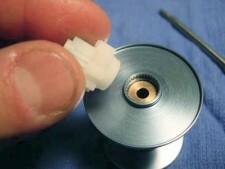 You will then recieve aa email to let you know the cost of reel repair or service. Small repairs and servicing can be just a few days. Reliable reels are maintained reels. Your Parcel can be sent to our shop address on our contacts page.